Let me said it straight. This was the best Audax event I have ridden in the UK. 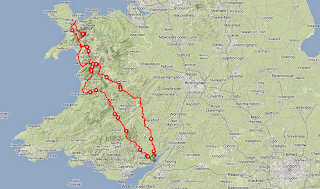 The Brian Chapman Memorial 600 is a great ride; it crosses Wales from south-east to north-west and back. This means the scenery is amazing, there are lots of good climbs and the roads are great. It is also a well planned route, very easy to follow, with well spaced controls (always around 75Km between controls), some of them in unbelievable beautiful places. 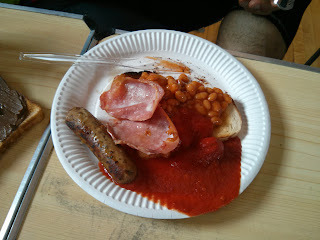 But not only that, in most of the controls free hot food was offered to riders and some of them, the right ones, free beds were also offered. If, to all that, you add that I had the opportunity to meet and ride the whole event with Alberto, meet Lucy (the authors behind Machacas on Wheels) and that we all had a weekend with great weather it is easy to understand why I think this has been one of the best cycling weekends I ever had. But great things don't come easy. Last weekend's 400 let me thinking that my strategy of going all out for 200K and then surviving the rest of the ride was not probably the best strategy if the "rest of the ride" is a 400K with lots of climbs. A very busy week at work meant I ended up arriving to the room I had booked near the head quarters around 11pm. Wake up was going to be at 5am so not exactly the most resting night. My last thought before falling sleep was still a doubt about my strategy for the next morning. Quite possible Alberto and I are the only two Spaniards riding Audaxes in the UK and it is curios how we got to met on this morning. 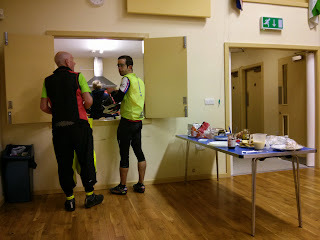 Searching for information about audaxes and Paris-Brest-Paris Alberto found this blog around two years ago. He commented in one of the posts and then I realized he had a blog with his partner, Lucy, Machacas on Wheels; a great blog about Audax rides, so started to follow them. A couple of months later I thought I had recognized him among the cyclists starting Etape Cymru 2011 I wasn't sure at the time, but it got confirmed when I checked at home his dorsal. Funny enough, like a year ago, I was on a train towards Waterloo and saw Alberto and Lucy with their bikes two or three platforms away in Clapham Junction. We were reading and commenting each other's reports but it was not until this morning when we finally met in person. And that was a relief because it gave me the perfect excuse to definitively abandon my original plan and switch it for a much more reasonable "lets start riding with Alberto and will see how it evolves". 6 am in the morning and there we go, two Spaniards among 120 riders, a pretty big event in Audax scale, the biggest I have ridden if I don't count Paris-Brest-Paris. The first stage was an easy one. 72Km with just a couple of easy climbs, ridden in small groups when everyone still feels strong. A great opportunity to say hello to many known faces (unfortunately with few names attached to them) and to confirm that riding with Alberto was going to be great. We had similar paces and his conversation was interesting. By the time we arrived the first control it was too early (8:45) to stop for long time so we agreed on get the brevet stamped and keep it going until the next control (154Km). When I think about it I know it sounds surreal: "stopping with "only" 72Km is too early", "Yeah, lets keep riding for four hours and stop at 154km"; crazy, but I bet that's what most of the riders thought and did. What we didn't know, because we had not a clear idea of the profile of the route, is that in those 82K we were going to find the first big climb. 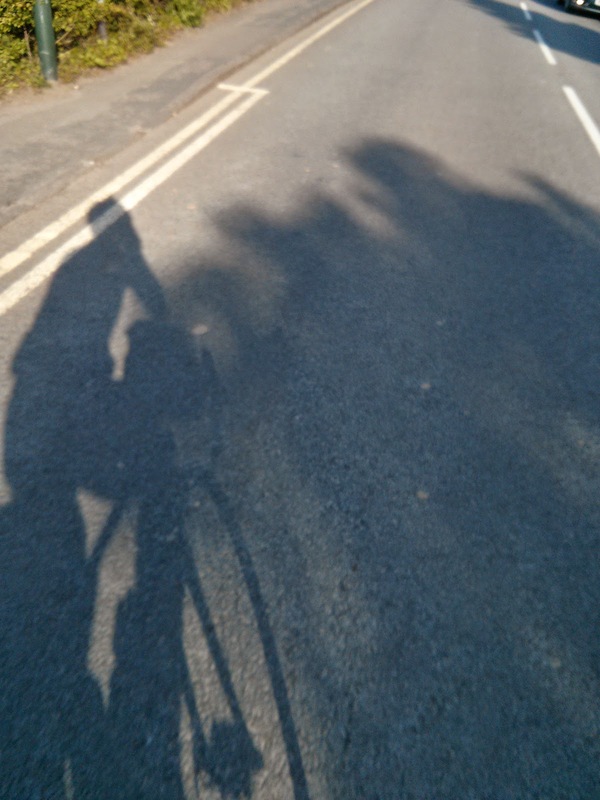 It was an unusual climb; good surfaced road, steady and long. Alberto struggled a bit due to problems with his stomach but overall we did great. It was 12:25 and we had arrived the second control. The plan was to stop, eat something quick and keep it going. But the plan didn't work out. 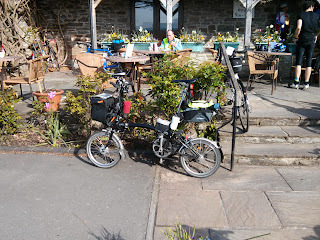 There was a queue in the caffe and it was moving very slowly so it took us longer than planned to get the food. But, hey, we were not in a rush. 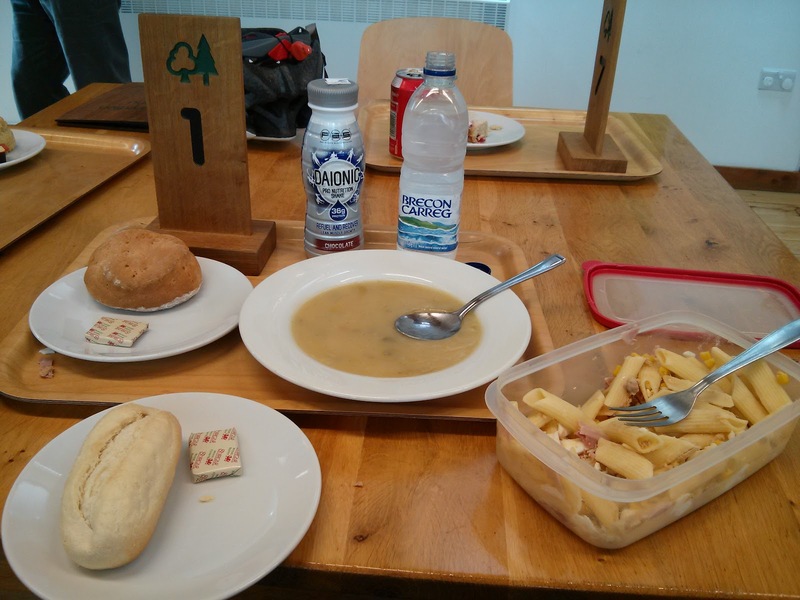 Relax and enjoy the leek and potato soup and half of the pasta salad I was carrying. The good thing about having a control in the top of a climb is that you start descending, and that helps. I thought we were going to ride in that peloton until next control but at certain point of the climb I took a turn in front of the group. If you asked me I would have said I had kept the same pace, but the reality is that by the time we got to the top the group was all scattered. I clearly have a lot to learn on pace making. Anyway, as said, these 70km went away almost without notice until we took the left turn to start the last kilometer and a half climb that took us to the control. It was not a brutal climb, but it easily had a 10% it certainly was noted. 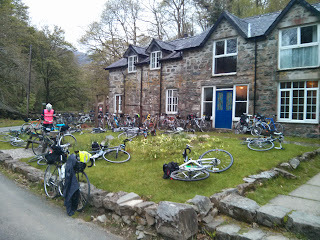 The control at Kings YHA Hostel was a great surprise. In a deep close valley, surrounded by trees; a mystical and peaceful place. And in the middle of that magical place there was a hostel and in the hostel I met Lucy. Lucy had volunteer to help in the event while Alberto was riding it (you can read her report of the experience here). 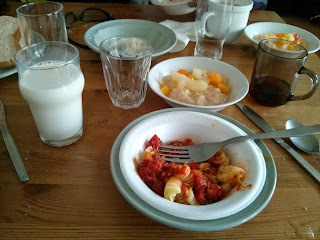 She welcomed us with vegetables soup, pasta and rice pudding. 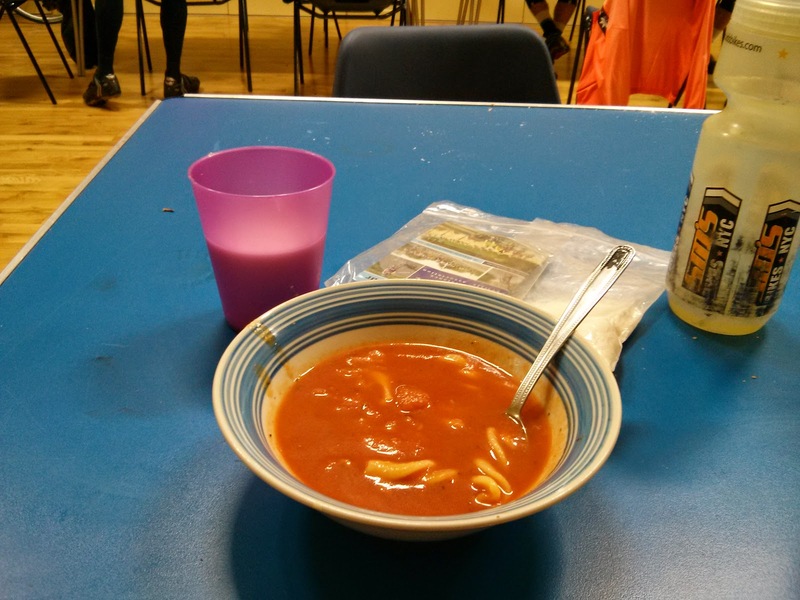 We already had launch on the second control, 70k earlier, but we were hungry again so we went for the whole menu, there was no doubt that we were going to burn all those calories; it was 16:00 we had 224K in our legs and we still had another 200K to be back at Kings YHA before we could get some sleep. 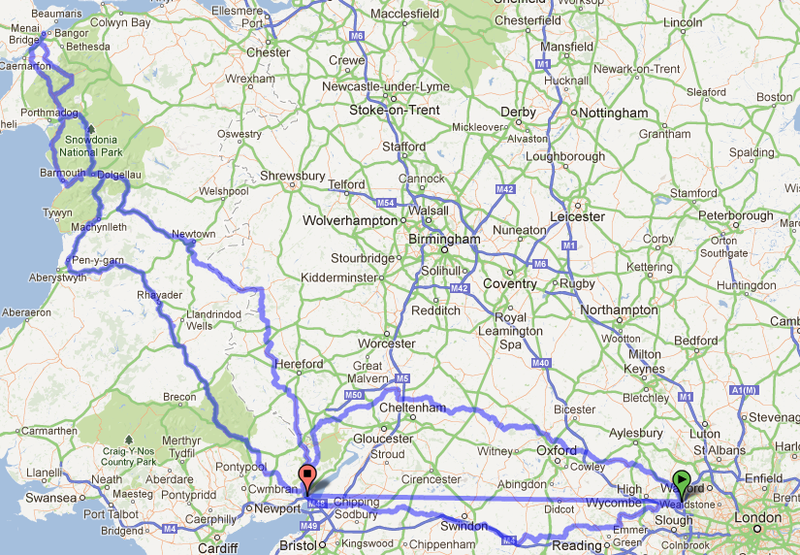 Next stage was the longest one. 90Km on paper that ended up being 100Km because one bridge was closed and we had to ride 10Km extra to cross that river. And within those 100Km it was included just another big climb, 10Km at around 2 or 3% Not bad when you have almost 300km in your legs. We were climbing leaving the valley with a lake on our left. As we were gaining in altitude the views were becoming more and more magnificent. We arrived to Bangor at 21:20. 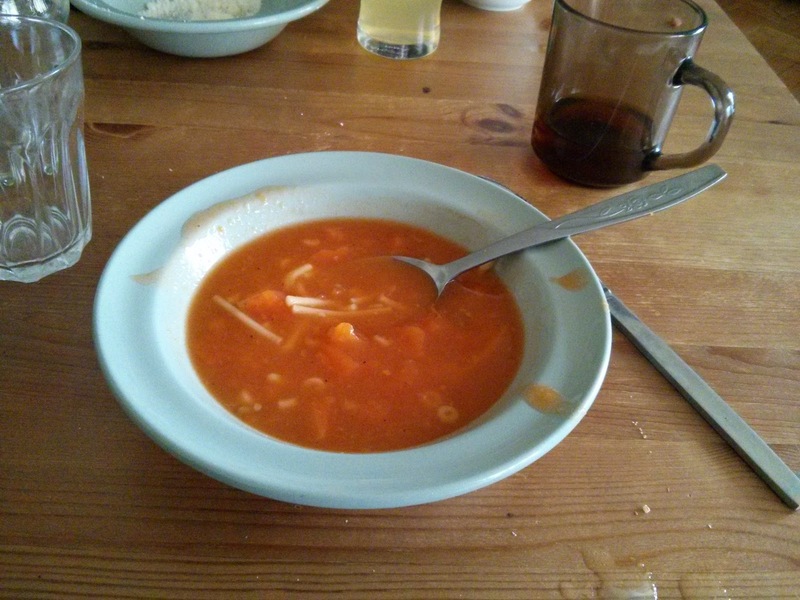 That was the farthest point of the route and it was the right moment to have the first dinner of the day. Kond, black top, on the left with back to camera, chatting to Mel Kirkland. By the time we were ready to go it was dark outside and temperature had dropped considerably so we put on extra layers of clothes and turned on the lights. We had 82Km to be back Kings YHA we were hopping to arrive around 2:00 am, 4 hours riding in the dark. And it was a pretty good ride. We had excellent conditions, a bit cold, but not too much; not much traffic on the roads either and the quality of the roads was still very good. At times we were feeling a bit sleepy, but a climb here and there, a few quick stops to pee or to get food were enough to keep us awake until the proximity of the control generated in us that excitement that makes you feel strong again when you really are not strong anymore. Feeling strong but not being strong anymore we climbed the kilometer and a half climb that took us to back to Kings YHA's control and that took its toll. When we finally arrived I was certainly tired and looking forward for some sleep. 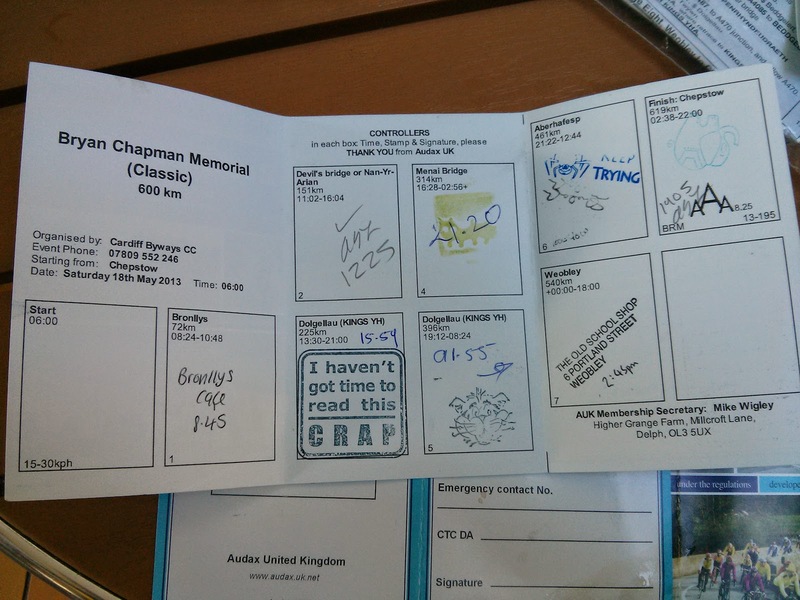 Our brevet got stamped at 1:55. 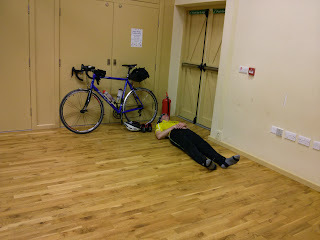 While we were having our second dinner we learnt that beds were available but each rider was allowed to sleep three hours. After those three hours you would be awaken to leave the bed to another rider. Of course if you wanted to be awaken earlier you were welcome. It was not our case, but I'm sure someone went for it. I finally went to bed at 2:00. Only three hours of sleep ahead so didn't loose any time, closed my eyes and the next second I was deep sleep. At certain point in the night someones mobile alarm went on. Beep, beep, beep. It took me out of Morpheus arms and the alarm was still beeping. Beep, beep, beep. Come on, turn it off!! I thought. I was in a room with six more riders and I had no idea whose mobile was beeping but it seemed like I was the only one noticing it. Finally the mobile stopped its annoying beep so I relaxed and fell sleep again. But only to be awaken again by the same mobile alarm. Beep, beep, beep. I couldn't believe it. Beep, beep, beep. And everybody was sleeping as if nothing were happening. Luckily the beep was interrupted abruptly. Finally the owner of the mobile was awaken and had stopped it. A second later I was sleeping again. I woke up at 5:00. Went straight to the shower and that helped a lot to fresh my body and my mind. Put on a clean clothes and felt like a whole new day. Muesly with milk and a toast for breakfast. And when I was having it Alberto appeared. When he asked about how I had passed the night I said, it was great, only disturbed by someone's mobile alarm... Yeah, It was mine, he said. I was so deep sleep I didn't hear it, he added. Man, I could have kill you; we laugh about it. You could tell this was becoming rush hour for breakfast. Everyone was getting up so Lucy was very busy serving breakfast to everyone. Without any rush we were getting ready to start the second day. Said goodbye, went on our bikes and started pedaling. It always the same. At the beginning my body rejects the idea of pedaling. It doesn't matter if I'm ready, my legs are not so I take it very easy at the beginning. But the beginning was very short because very soon we found ourselves climbing up something that never looked like a hill, one of those climbs that you are expecting it to finish after the next turn, but that endend up being a 8km climb with 350m of altitude gain. And immediately after the descend another climb. This was the opposite, one of those climbs that you see from far away. Those that when they are getting closer and closer they look more and more steep. In fact close to the top we could see a rider walking up his bicycle. It was not super steep climb but still it got me gasping for air when I reached the top. From the top of that second climb there was only the descend until the next control. We had ridden only 65Km and we were hungry again so was very, very pleased when I was offered a sausage, bacon and beans on a toast. I completed it with a portion of my pasta salad and a couple of glasses of milk. Lucy was also in this control. She told us they closed the control at Kings YHA, cleaned, packed and came to this control to help. Still the control was not busy so she had time to sit and chat with us. 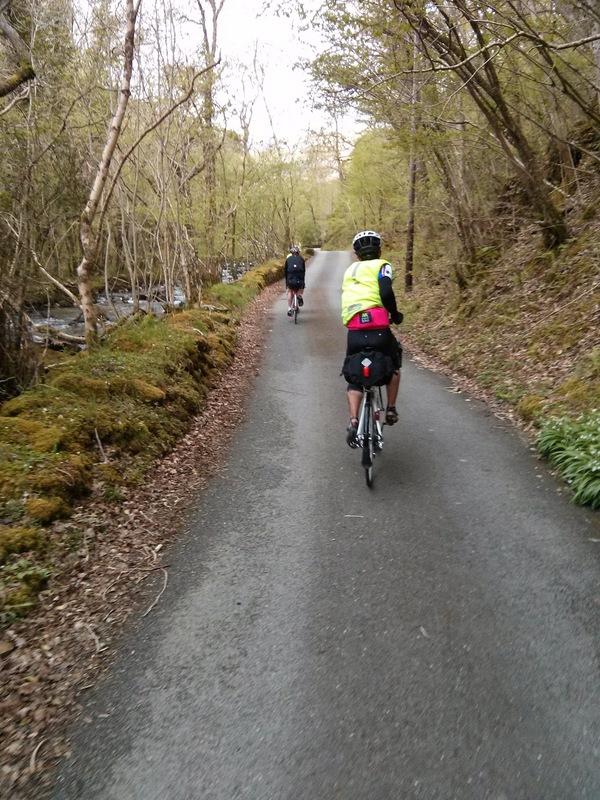 Next stage was 80K and when we decide to go back to the route we were joined by two or three more cyclists. We all road together until Newton where a climb started. At the beginning it wasn't very steep and it didn't look like a big climb. Again, it was one of those climbs that seems to finish in the next turn. But it wasn't. It kept going up and up. Not very step, but always uphill. I was leading the group climbing at what looked to me like an easy pace but three or four kilometers into the climb and it was only Alberto and myself in the group. The route sheet got the instruction to take a road on the left and the climb became a bit more steep. Again, not super steep, but enough to make us complain. And after that section the climb kept going up and up. I'm not sure if it was because the climb was looking like finishing in each turn and actually never finishing or because I had no clue how long the climb was going to be, maybe it was that we were riding very slowly (although we had dropped three cyclists) but the truth is it looked like it took us an eternity to get to the top. A quick calculation revealed we were climbing for 13Km and we were at the route maximum altitude, around 500m. 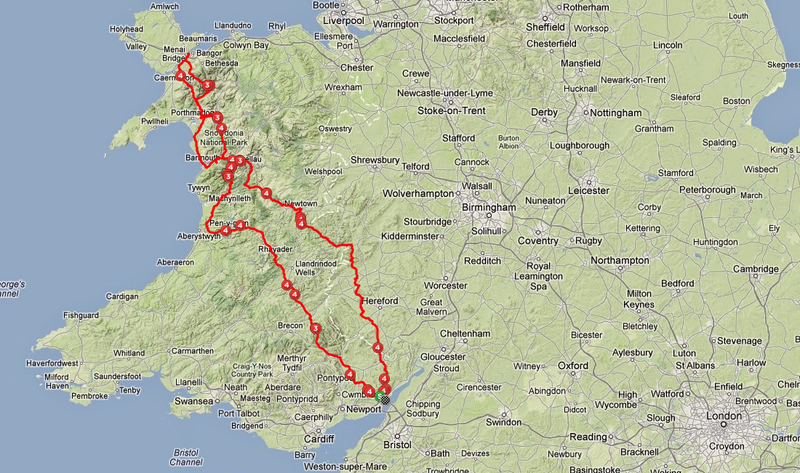 Not bad for something that never looked like a climb when you have 475Km in your legs. The descend was welcome for the change it represented and short enough to be sure we hadn't descended all we had climbed. And at this point we faced the crisis, we were finding it difficult to keep a good pace. There is always one. A moment where everything seems going wrong, when you feel tired and slow. The warm midday sun was making me to feel sleepy and Alberto was hungry. We were in crisis. The trick is to recognize the crisis and deal with them. I asked Alberto if he was interested in football and as he answered no we started to talk about cycling and the conversation woke me up. 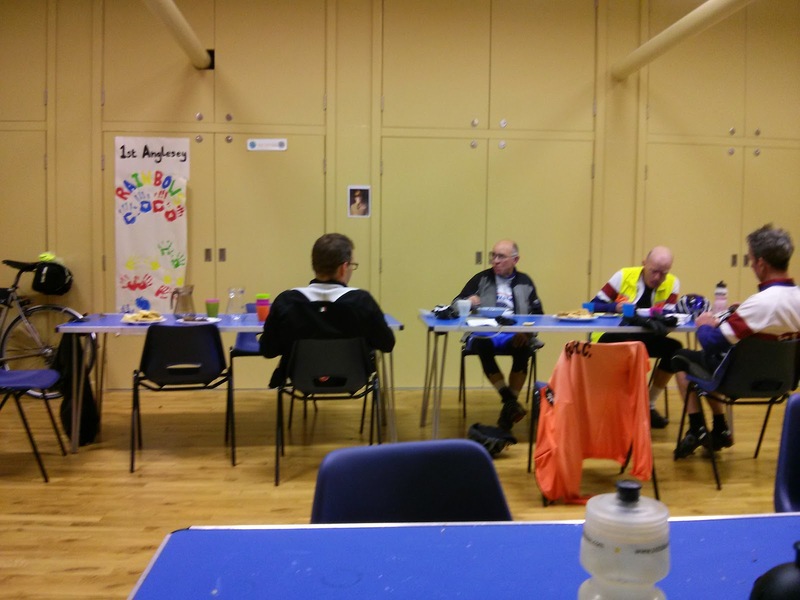 A quick rally to the shop of a petrol station and we had the opportunity to eat and drink. A tiny climb after that stop and the crisis was over. Very soon we arrived to the last control. It was 2:45pm, Spanish lunch time. I went for the rest of my pasta salad, a banana, a bag of doritos and an ice cream (magnun classic). We were sitting on the field, the sky was sunny and the temperature was great. The temptation of taking nap was very strong, but we overcame it. I'm still wondering how we did it but, anyway, no nap and we were back on our bikes with the last stage ahead of us. 78Km to go and the idea that we would finish around 19:00. The first part of this stage was, as Spanish cyclists say, a "rompepiernas" (something that breaks your legs). Up and down, up and down. Steep up, fast down. Fast down, but not fast enough to pass you through the next up. Impossible to get into a rhythm. I didn't bother to put the big the chainring when we were going down because I knew I was going to need the small one in the next up. We got tired of this game and we complained about it. The views were not that great any more, the road was not that good and we were not enjoying it that much. Up and down, up and down. 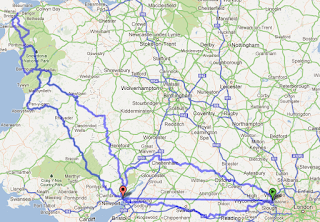 Up, up, up, up and down, down, down, down, down and we made it to Monmouth. 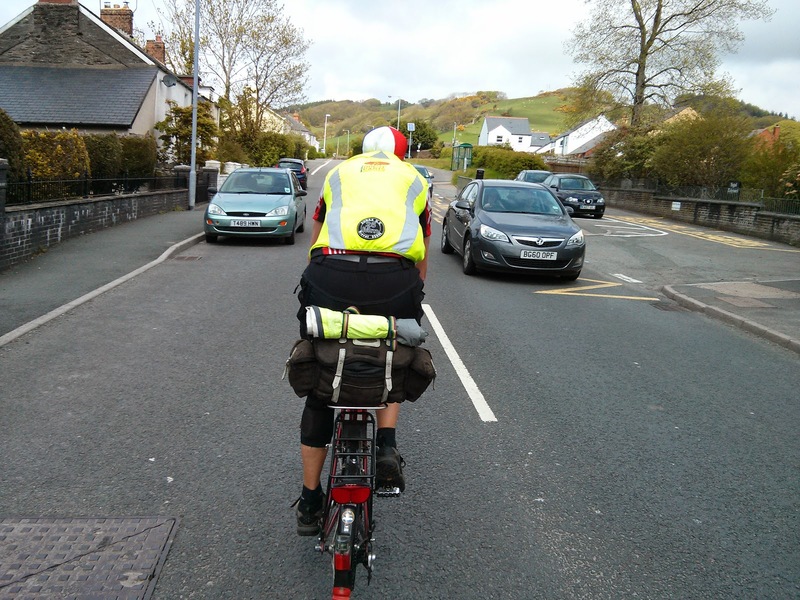 We got a bit confused crossing Monmouth. The routesheet was saying one thing and the GPS another one. After a couple of stops and checks we decided to follow the GPS. Luckily we saw that a group of cyclists were following us and very soon the GPS and the routesheet were aligned again. I recognized Judith Swallow (I think she is the woman with more super brevets - 1,000k or longer- in the world) in the group of cyclists that was following us. Although they were not following us for long because they were riding faster than us. They passed us, Alberto suggested to jump on their train and so we did. Sitting on their wheel it didn't look they were riding that fast, even considering the road was starting to climb. The endorphins inundated my brain and everything looked perfect. 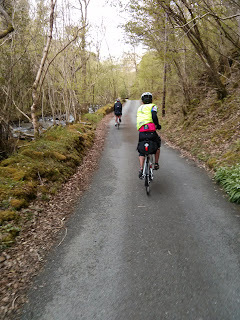 The road had a perfect surface, the climb was not very steep, the valley we were crossing was amazingly beautiful, the sun was shining and I was leading the group at a pace that felt very easy to me. I wasn't feeling any tiredness in fact I was feeling like if I could sprint up the hill, I almost wanted to. 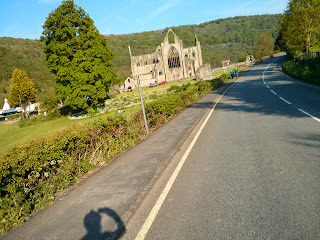 Second attempt, Tintern Abbey. Look at the sky, the forest on the left, the quality of the road. Everything was perfect. Those 20K flew away and a fast descend took us very quickly back to the head quarters 37 hours and 627Km after our departure the day before. Lucy was waiting for us at the control. 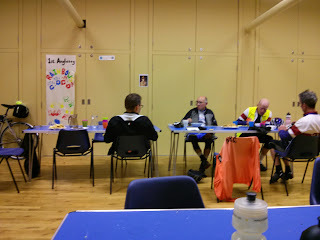 We got our brevet stamped got some food, a bacon sandwich for me, and relaxed a bit in the great atmosphere that was at the control. Everyone seemed to feel happy. 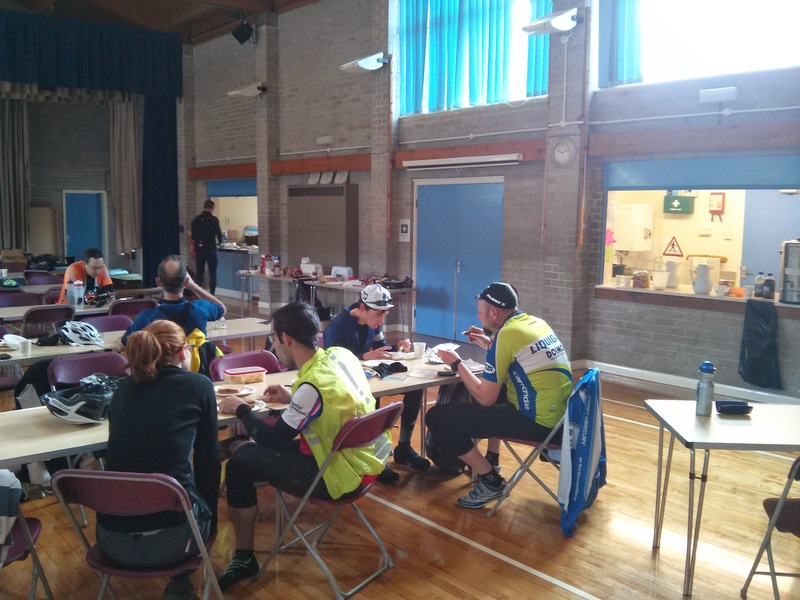 As said this was the best Audax event I have ridden in the UK. Everything went perfect (the company, the route, the weather, the organization) and it was the perfect rehearsal for LEL. What else can be asked for in a cycling weekend? 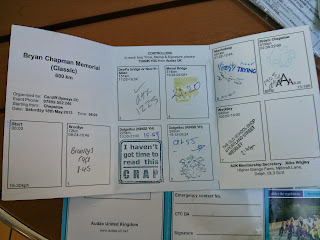 Alberto's report can be found at Bryan Chapman Memorial 600: the rider experience. A video from one of the riders. 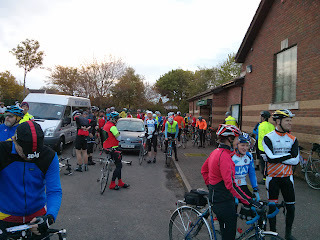 I love the way it shows the Audax spirit and how everyone is smiling (I appear at 5:51).